Industrial fire protection depends on water spray fixed systems. Design and install systems you can count on with NFPA 15's new installation and maintenance requirements. Keep fire protection systems up-to-code and ready to respond if fire strikes in an industrial facility. 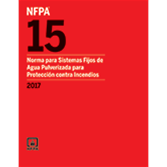 Reflecting the latest technology, engineering principles, test data, and field experience, the 2017 Spanish edition of NFPA 15, Standard for Water Spray Fixed Systems for Fire Protection covers the design, installation, maintenance, and test requirements for fixed water spray systems. The Standard also includes minimum requirements for the periodic testing and maintenance of ultra high-speed fixed water spray systems. Interested in other editions of NFPA 15? Use the drop down menu above to select the edition year you need.